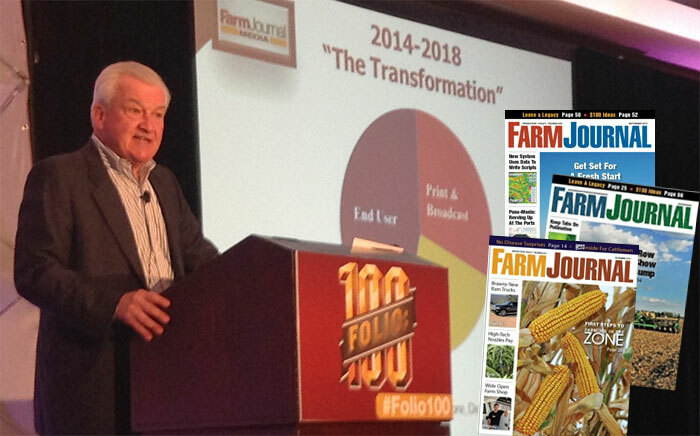 “Think a decimal bigger.” That ambitious directive from CEO Andy Weber (pictured) has become a winning mantra at Farm Journal Media, a fully integrated multimedia company that has doubled in size over the past five years. Weber’s big think initiative, combined with a determination to bust silos and institutionalize innovation, has allowed his 137-year old company to fuel expansion through internal growth rather than acquisition. 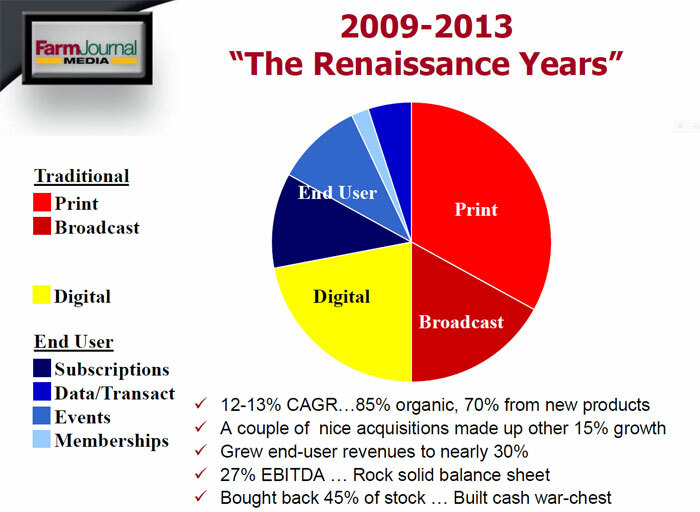 Today Farm Journal Media maintains 41 products that generate over 23,000,000 monthly agricultural touch points. And Weber plans to double the firm’s size again over the next five years. Weber highlighted one digital product: Commodity Update. This acquisition is now a multimillion dollar text marketing business that has grown to 75,000 subscribers from the 15,000 when it was purchased. It now has an 80 percent market share in the agricultural text marketing messaging business. While only a third of the company’s revenues come from print advertising, that portion is 35 percent bigger than a decade ago. Again, the increase resulted from internal growth rather than acquisitions. Print products include the company’s flagship Farm Journal, as well as Top Producer, Beef Today, Dairy Today and Implement & Tractor. “We're not deemphasizing print,” says Weber. 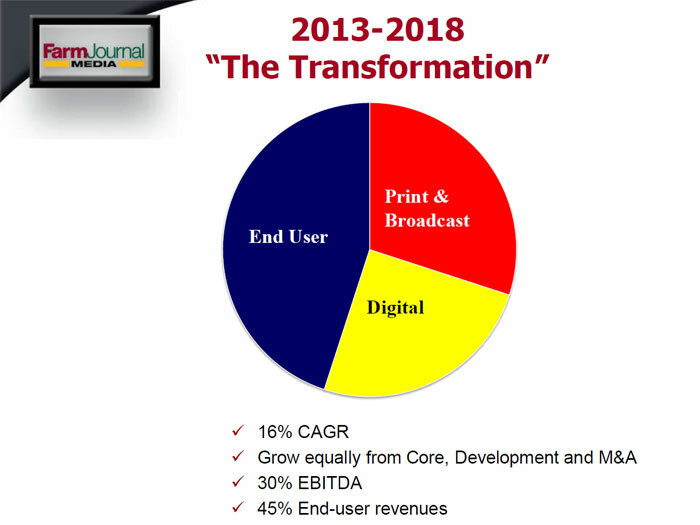 “The flagship publication will always be part of our culture.” Together, digital and print revenues represent about half the company’s business. On the go-to-market side, the company found itself going outside the publishing industry, hiring B2B market guru Mitch Rouda when digital revenues had stalled at 10 to 11 percent of total revenues. One of the most important initiatives was to institutionalize innovation. “Creativity has to be cultural,” says Weber. The results were favorable: Of the 26 products introduced in the past five years only three were acquired—the remainder were developed from scratch. A big part of promoting creativity was a recognition of the attendant risk, says Weber. “You have to encourage people to take risk and you can't kill them when a project fails unless it fails for the wrong reasons.” Indeed, over the past decade the company developed around 10 projects that were failures or only marginally successful.